Interspecifics uses custom-made “ontological machines” to generate music from the bioelectrical activity of bacterial consortiums, plants, slime molds and, in the process, humans. 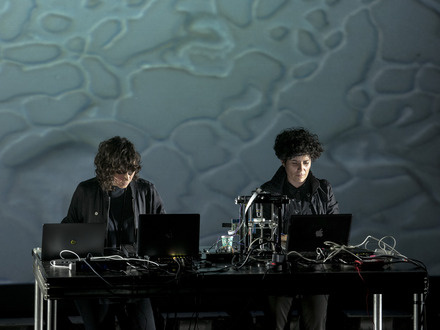 Leslie García and Paloma López work as composer-creators at the intersection of music, installation and science. They're observers and transformers of physical phenomenon, bringing several artistic and scientific disciplines together to craft a living, hybrid art that uses DIY and custom-made sets of hardware they call “ontological machines.” Leslie García is an electronic artist and digital media developer, co-founder of the Tijuana-based electronic media collective DreamAddictive, member of Mexico City-based Astrovandalistas and a research associate at Nucleo Laboratorial Nano de la Escola de Belas Artes – Universidad Federal do Rio de Janeiro. Paloma López holds a Master of Creative and Cultural Entrepreneurship from Goldsmiths, is part of Tijuana's Radioglobal collective and is the research director at online contemporary culture platform Estándar. Among Interspecifics's recent works, Speculative Communications involved inventing a “non-human intelligence auto-generative system,” an artificial intelligence machine that turns behavioural patterns of a microorganism into source material for an audiovisual score. Their GFP Screen project turned proteins from E. Coli into a neon light installation that responds to poems written in code and Ensemble Terreste combines acoustic drums with a mechanized electronic system and a software system that captures seismic data. Along with their creations, Interspecifics designs public workshops where they share Open Source developments with other artist-researchers. Among their many collective and individual international performances and presentations, at last year's MUTEK Mexico Interspecifics performed Space data and noise, an eerie ambient arrangement of NASA radio transmissions and other sounds from space. At MUTEK this year, Interspecifics generates a sonic meeting ground where humans can physically experience the reality and agency of organisms and physical phenomena that typically go unacknowledged—a perspective-shifting experience that invokes broader metaphors of difference, empathy and consciousness.